The Washington region will receive a much-needed soaking this weekend, but that could throw a wet towel on your getaway plans. 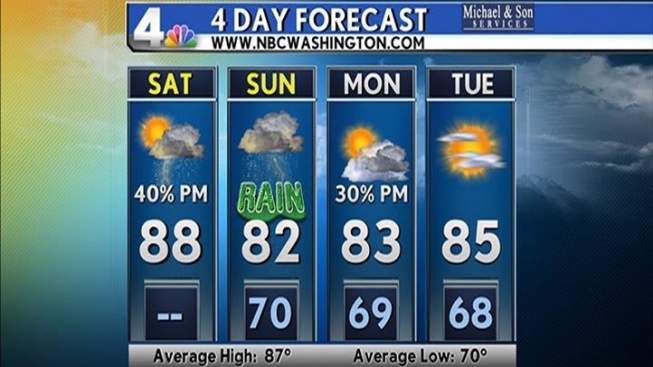 News4's Kim Martucci says residents should expect sporadic showers throughout Saturday, which could turn into thunderstorms. There will be a short break in cloud cover around midday, but rain will be a threat for most of the day, with heavier storms arriving in late afternoon. On Sunday, get your galoshes. The region could see between 1 to 2 inches of rainfall. That will be a relief for the region's lawns and gardens, which have been suffering through a rainfall deficit. The area is 5 inches down from the average for this time this year. Watch out for flash flooding and pooling near roadways Sunday morning, when sudden and heavy rain falls on dry ground. Also notable this weekend - a 6,000 acre fire continues to burn at Great Dismal Swamp at the Virginia-North Carolina border. Winds have blown that smoke northward, and viewers as far north as St. Mary's County have reported smoky, hazy air quality conditions there.